These poems were written for a commission for The Grassington Festival – Art Trail in the wonderful summer of 2012. I would especially like to thank the unsurpassable Bryony Pritchard for her organisation of this special event. The poems are a response to the print “The Minotaur” by the Australian artist Sidney Nolan – which was exhibited close to the installation of my poems (which were written on lead slates). I looked at the idea of The Minotaur from many perspectives. I loved Nolan’s idea of re-engaging myths. It seemed to chime with Walter Benjamin’s ideas of auratic perception. I revisited writings I hadn’t picked up in nearly twenty years and saw something which seemed to hit nerve. I began to draw in myths and tales from all manner of places. The main links are directly with the original Minoan myth, with the mythological creatures of Nolan’s native Australia, with Nolan’s biography itself and – probably most importantly – with the rituals and sheer horror of the lead mining which made the village of Grassington prosper in the 18th and 19th centuries. I also visited the Necromanteion and the river Acheron in Epirus. The rituals and stories of death’s communion hang over the poems. 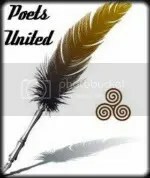 If you’d like to read the poems, click on the image, or the tab at the top of the page. The poems spread over a number of pages and are in reverse chronological order. Hmmm, not sure on the Morrells… weren’t they at Garsington? Grassington is a village in the Yorkshire Dales – in Upper Wharfedale to be precise. It was a major lead mining area (from Roman times up until the 19th Century). I’d be more than happy to supply info/writing for scienceandartblog.com . It is a fascinating project, and something I am personally very interested in. In previous incarnations I organised science and art lectures for the Edinburgh Science Festival, and I also set up a poetry society when I worked at the Natural History Museum.